Jewish books almost always show evidence of active use. This is especially true of prayer books, which tended to be used intensively. The overall condition of this medieval prayer book, therefore, is note- worthy. The graceful Ashkenazic square and semi- cursive hands and the fine parchment used resulted in an elegant volume. It contains daily prayers, selected piyyutim for festivals and certain special occasions, a variety of special prayers, and the full text of the Passover Haggadah, the first page of which (folio 54v) is reproduced here. 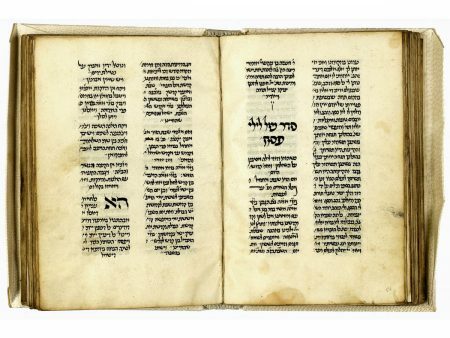 The Haggadah, which had grown within the daily prayer book from the days of the Geonim onward, was already considered to be a separate book when this prayer book was copied; its inclusion in a prayer book, however, was not yet uncommon. The manuscript presents an interesting example of the impact of censorship. During the Middle Ages the Alenu le-shabbeah prayer, which is recited at the end of the statutory services, was believed to contain an implied insult to Christianity. The verse “for they prostrate themselves before vanity and emptiness and pray to a God that does not save” was seen as a reference to Jesus, in spite of the fact that the second part of the text is from Isaiah 45:20 and therefore precedes the New Testament. In this manuscript (fol. 19r–v), as is the case in so many others, the anonymous copyist decided not to include the problematic text. He left an open space, however, perhaps for a later owner to add the omitted passage. Popper 1899, esp. pp 77–79; Raz-Krokotzkin 2007; Sotheby’s New York 2004c, lot 35.